Mississauga mayor “Hurricane” Hazel McCallion is set to publish her memoir this October with HarperCollins Canada. The aptly titled Hurricane Hazel: A Life with Purpose will be co-written by Robert Brehl, the co-author of Canadian business tycoon Ted Rogers’ 2009 memoir, Relentless. With municipal elections scheduled for October in Ontario, McCallion will retire as mayor of Mississauga after 36 years, making her the city’s longest serving mayor and among the longest serving elected leaders in Canada. Born in Port Daniel on the Gaspé Coast of Quebec in 1921, McCallion began her career at an engineering and contracting firm in Montreal in 1942 and was later transferred to Toronto. 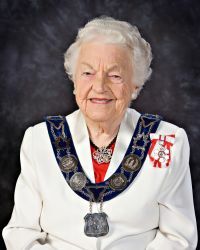 She made her first foray into municipal affairs in 1967 as chairman of the Streetsville Planning Board and, in 1978, she began her first of 12 consecutive terms as mayor of Mississauga. The book was acquired by HarperCollins Canada’s non-fiction editorial director Jim Gifford.